Like much art of the late twentieth and early twenty-first century, Alex Katz’s work must be seen as a reaction to and against what came before it, namely the all-encompassing specter of New York School abstraction. Viewers unarmed with that insight are likely to encounter Katz’s naively rendered figures, rudimentary compositions and insipid colors puffed up to monster-truck scale as “all surface, no feeling”—a critical assessment that has dogged the artist on and off for the six decades or more. Now in his ninetieth year, Katz’s latest exhibition “Grass and Trees” at Richard Gray Warehouse seems set to upend the consensus that crystallized around the canonical painter’s oeuvre. Featuring a Geiger counter-spiking assortment of acerbic greens and yellows, the handful of billboard-sized paintings in his 2017 “Grass” series unapologetically plumb the style and syntax of last century’s gestural abstraction. It’s as though in his advanced age, Katz has ironically embraced the very thing that drove him to figuration in the first place. But the veneer of painterly bravura can’t disguise the fact that the aesthetic through-line in “Grass and Trees” is much the same as it always was: simple, flattened forms with an emphasis on the support’s surface. If, as critic John Yau claims in the exhibition’s catalogue, the “Grass” paintings “mark a radical departure from Katz’s earlier work,” I can’t see it. After all, one might employ several means of transportation and still arrive at the same destination. As to the “Three Trees” and “Road” paintings also on view, their compressed space, reductive shape and generic modeling of light and shade are classic Katz. In defense of his return to figuration, the late painter Milton Resnick once said, “you always come around to what you hate.” In his case, the full-throated embrace of the figure was a natural consequence of an almost religious zeal for the materiality of oil paint. Like Pygmalion’s marble, fashioning the figure from paint became Resnick’s Galatea. For Katz, the loosely brushed armatures of “Grass” numbers five, six and nine are neither a breakthrough into a new way of painting, nor a creatively necessary recant of his previous positions. Rather, these works are recapitulations of a lifetime directed at painting in quotation, of looking at the world and finding a visual shorthand for it. Fans of Alex Katz will find their predilections confirmed, while doubters will remain unconvinced. Equal parts fashion show and art-history lesson, Andrew Holmquist’s “Alter Ego” dazzles the viewer with a diverse assortment of Technicolor “looks” in the guise of eighteen blisteringly frenetic works on paper. 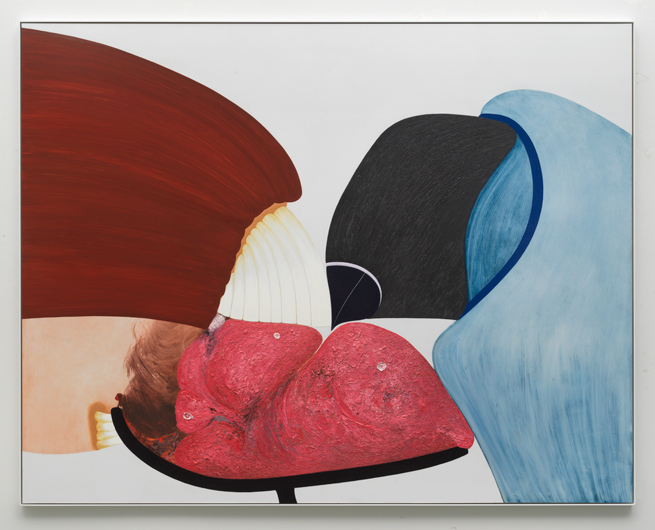 In his fourth solo show with Carrie Secrist, the now-Berlin-based painter continues his longstanding flirtation with the porous boundaries between figuration and abstraction while affirming that identity is little more than a costume. The six large-scale pieces that anchor the show have a corporeal presence. Clocking in at nearly seven-feet tall, these multivalent “Strong LQQs” are bossy and structurally reminiscent of de Kooning’s infamous “Women” of the early 1950s. Composed with an alluring combination of colored pencil, pastel, gouache and spray paint, the lemon-yellow figure in “(Jubilee)” holds the space centrally and is as much an excuse to paint, draw and luxuriate in pure color as it is a conveyor of meaning. Holmquist’s work has always slid effortlessly along the buffet line of modernist painting. But whether inflected with hints of cubism, futurism or expressionism, style-checking his works’ formal antecedents never gets in the way of what the artist is saying. “Alter Ego” is suffused with subtle and wry critique; of the fickle, fashion-show-like nature of the contemporary art industry and our collective obsession with identity. These luminous and playful images recognize that our sense of self is a mutable theater and that to pin ourselves down as one thing or another is basically pointless. Like the androgynous mannequins that Holmquist hangs his painted attire upon, we are changing all the time. The alter ego and the doppelgänger are one and the same. In an age of selfies, self-assertions and selfishness, Holmquist’s show reminds us that we needn’t over-aggrandize the one thing that doesn’t really exist. For a second year, Zolla/Lieberman Gallery kicks off 2018 with a survey of recent works by graduates of the School of the Art Institute of Chicago. Featuring coolly composed paintings by Blake Aaseby, Heesu Jeon and Elaine Rubenoff, along with scorchingly expressive gestures by Herman Aguirre and Maura O’Brien, “In/scription” attempts to ground dizzyingly divergent approaches to touch, application and subject matter in the acts of reading and writing. Blake Aaseby’s achromatic surfaces are the exhibition’s highlight. Vibrating with a luminous linear sgraffito carved into a quarter-inch-thick frosting of white oil paint, the artist’s works depict the right angles and clean lines of the urban environment. Paintings like “Transitory” and “Two Cities” feature a Twombly-esque pre-verbal scrawl and come the nearest to embodying the show’s stated theme. Maura O’Brien’s three painterly canvases recall the late landscapes of French artist Nicolas DeStaël. O’Brien has an incisive eye and a seductive touch, but she’s not especially well represented by the works in this exhibition. Where her paint-encrusted sketchbooks were a highly memorable part of last year’s claustrophobic SAIC MFA show, here only the deep green-greys and swirling brushstrokes of “O The Moonlight Shines” give a sense of what she’s capable of. When critic Harold Rosenberg referred to Helen Frankenthaler as “the medium of her medium” it wasn’t meant as a compliment. In Elaine Rubenoff’s case, the application of the stain technique into raw canvas is controlled, precise and intentional. The hyper-real color and large scale of her untitled floral canvas are imposing, but the imagery and treatment are soothingly bucolic. On the other side of the spectrum, Herman Aguirre’s sculptural use of paint to craft flowers in a landscape is so excessive that it verges on parody. While “In/scription”’s paean to stylistic and thematic diversity is admirable, the fuzzy curatorial premise results in a show with moments of individual charm, but remains collectively unsatisfying. Unlike last year’s “Layer Cakes” exhibition of recent SAIC grads, which kept the figure and a wry sexuality front and center, there’s virtually nothing uniting these paintings, other than the fact that the makers share a common gallery and alma mater. Given that a 2014 study by BFAMFAPhD found that forty percent of all working artists have no degree whatsoever, I wonder whether or not it’s time to seek talent in pastures farther afield than the city’s major educational institutions. Beauty is a troublesome thing; but pleasure is even worse. Beauty offers ecstasy in redemptive and occasionally bittersweet truths. Pleasure, on the other hand, is grounded in desire, and desire invites all manner of perilous things. Like a riptide snaking its way towards shore, pleasure cloaks itself as beauty, luring the unsuspecting in and then drawing them out to sea. 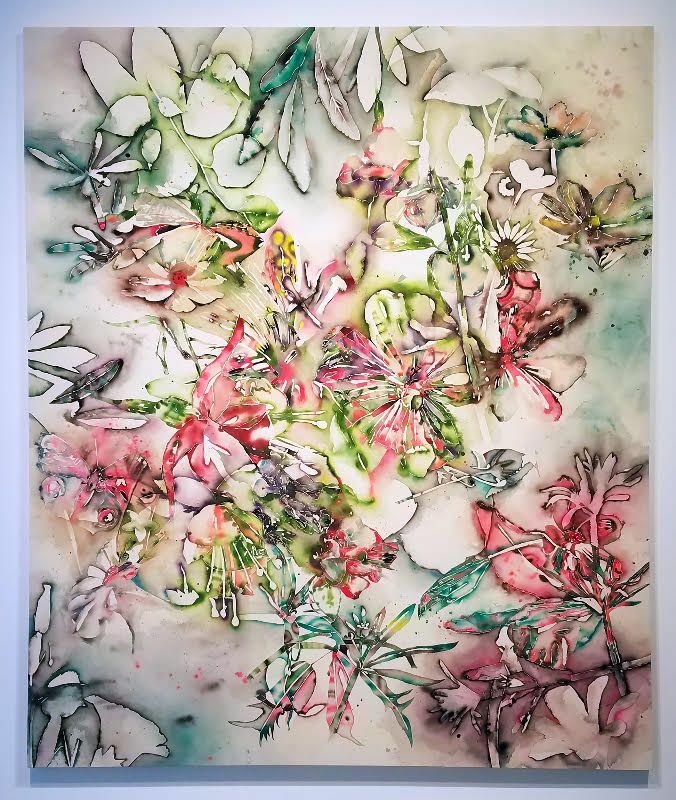 Like these unruly tidal forces, John McAllister’s botanic haunting soft-static at Chicago’s Shane Campbell Gallery, is equal parts bliss and discontent, desire and its frustration. 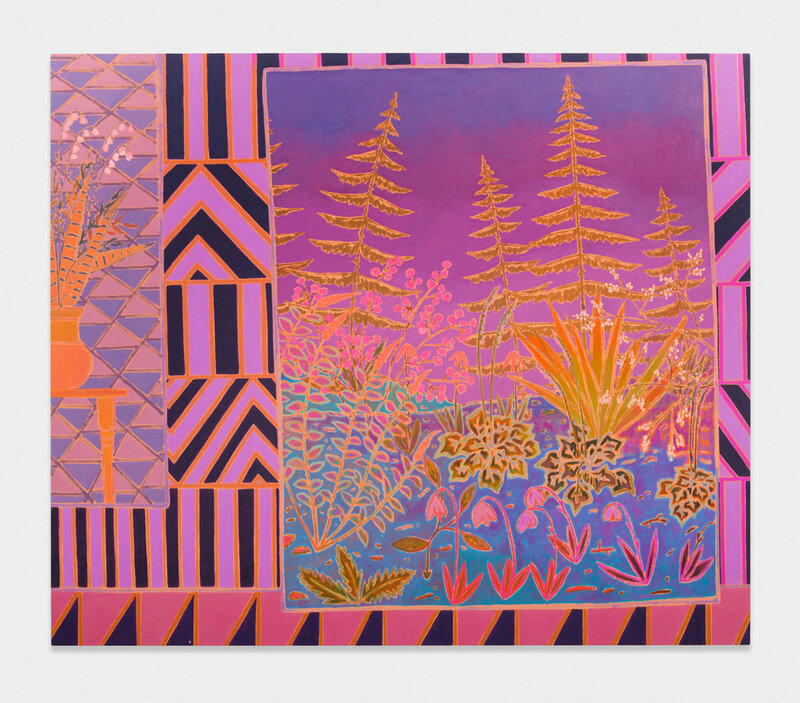 The nine paintings and three folding screens on display are nominally still-lifes and landscapes en abyme -each piece delivering the artist’s trademark, sybaritic bursts of intense ultraviolet sensation. But like a fever dream’s caustic hallucinations, fact and fiction are blurred. It’s virtually impossible to read a piece on McAllister’s work that doesn’t include the ubiquitous reference to Matisse. Beneath the surface, however, the comparisons aren’t especially apt. For Matisse, everything was a question of seeing. Every piece of fruit, every rustling curtain, every sensuous body lounging in the Cote D’Azur’s clear light and warm air was fiercely observed by the master’s gaze and reified by his brush. In McAllister’s paintings, it’s questionable whether he sees any of his ornaments at all. The sun-scorched tropical Eden of botanic haunting soft-static, a flatland of interlocking planes and red-violet color, luxuriates as finely crafted works of fantasy -pictures of pictures embedded within pictures. Drawing you in with their lustful luminescence, the paintings dash you upon the rocks with detached perceptual uncertainty. For McAllister, the landscape is the quintessential allegorical motif. Like art, nature is a complex ideological construct, a seductive and useful fiction, and the botanical garden doubly so. Awash in Chernobyl’s twilight, the spreading palms, arching tulips and squatting ferns in these paintings are placed, not planted. And the screens of clouds sugared silence are more like the incandescent flickering and infinite scroll of the super AMOLED than the orientalist home décor from which they derive. Delivering a highly saturated and flattened vision of an already compressed world, the anachronistic formal structures of works such as choir may carouse are far more contemporary than they first appear. Though they be clothed in last century’s liniments, these paintings embody the intoxicating satiety and cultivated deception of our omnipresent social-media. Supplanting the mystery of the boundless ocean with the inexhaustible image feed, it’s a Siren song forever promising more. More pattern, more color, more light. Whether knowingly or not, McAllister has composed a forceful and prescient social critique on the nature of -and our obsession with- sensual appearances. Writ large in a modernist vernacular of oil on canvas, his deftly composed surfaces of unalloyed epicurean pleasure, unconcerned with rectitude, beseech us to look and then look away. These paintings seem to say: all that light and color; it’s too much. All that joy and pleasure; it’s too much. Turn away; you must. But we can’t. Out here the shore is just a line on the horizon, and soon it will be visible no more. A second gallery features a “false studio” flush with magazines, doodles, music and other source material, a nod to those who want to be reminded of the artifice of the whole thing. A tad too self-reflexive, it’s inessential viewing, but there’s a pleasant Elizabeth Peyton-like quality to the drawings on the wall, and a soundtrack by Cocteau Twins will make any space better. Ultimately, the strength of Eastman’s work is found in its outward-facing gaze—there’s a seriousness to her cheeky reportage that’s both well conceived and executed, culminating in a show that is not to be missed. Awash in formal and psychological tensions, drama and decay, Lui Shtini's "A Sawdust Feast" unnerves and unsettles. Featuring six oil on Dibond surfaces that pressurize shapes and space in unpredictable ways, Shtini grounds his forms on the fringes of figurative legibility. Once recognized, playful abstractions adopt sinister overtones. In The Loot (2017), a cresting wave of burnt sienna gives way to a set of elongated, ivory-inflected teeth. Joined by the black beak of some cerulean-hued villain, they gnash into the variegated red facture of a fleshy form. Likewise, the near non-objectivity of Strapped Down (2017) hints at a grasping appendage dappled with blood. Shtini's visual statement is forceful because the works are initially so seductive. With contrasts of matte versus high-gloss surfaces and linear versus painterly treatments, the pictures are catnip for lovers of abstraction. But they are also haunting ruminations on the inherent violence of consumption. "Automythography" casts its curatorial gaze upon cultural heritage as a source of form, technique, and creative inspiration. In Journeyman II Mequitta Ahuja uses a palette of earthen hues to depict a mythical self-portrait rafting down an abstracted river. Her works anchor the exhibition with a mystical, John Graham-like quality. Kambui Olujimi's six portraits of his late mentor in Walk with Me act in a similarly ethereal way. Other artists emphasize the communicative power of materiality in their works. While Ato Ribeiro repurposes discarded wood scraps into relief-like depictions of kente cloth. Kaveri Raina deploys the coarse weave of burlap to create incongruously light abstractions. Alex Yudzon embellishes his mementos of Soviet childhood with the humble sunflower seed. Taken together, these artworks constitute an atlas of specific background and experience universalized by art's transformative nature. Brooklyn-based artist Kadar Brock delivers a concentrated exhibition of paintings and drawings tinted with the vaporous pastel hues of Monet's late work. Impressionism, with its subtle depictions of shifting light and form, of realities glimpsed but not clearly seen, is an appropriate metaphor for the results. Like most of the show's works, the variegated surface of green teal brush strokes brush strokes hannah cursed seal is peppered with holes and small tears - a telltale sign of Brock's aggressive application and sanding technique. But these ruptures read as graceful marks floating effortlessly among the crisscrossed limbs and distorted foliage of some half-remembered primeval forest. Other pieces pay homage to the artist's interest in Manga and post-apocalyptic narratives, but as his images acquire easily legibility, the creative engine seems to sputter. Like any good mystery, the paintings in "summon artifact" succeed by alluding to what might be present, real or imagined.